Laying 22,000m² of superflat warehouse oversites (to a tolerance of 3mm) for a sorting office and associated buildings, a 1km feeder road (10m wide) and footpaths incorporating infrastructure sewers (150mm to 1350mm in diameter) in addition to bulk earthworks, groundworks and external works to the 14 acre commercial development. The construction of a new roundabout and 1 mile of road widening adjacent to the A6 adopted by Bedfordshire Council to enable a major new residential development. 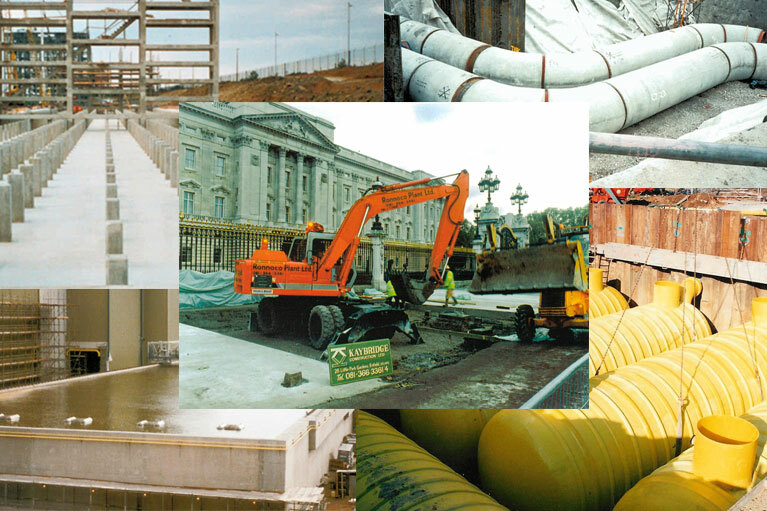 Our involvement in this project included the construction of a cooling water pond with structural columns to support cooling towers; 300 metres of pipework for the cooling water system; access stairs for cooling towers and in-situ reinforced concrete structures for two gas turbine houses. Installation of a surface water storage facility for a new housing development which necessitated the construction of a steel sheet piled cofferdam to the 6 metre deep excavation and the installation of a dewatering system to control the standing water table found 600mm below existing ground level. Working in association with the Royal Parks Authority Kaybridge carried out the pedestrianisation of the area surrounding the Queen Victoria Memorial outside Buckingham Palace. A 200m wide reinforced concrete sea water holding tank for a gas turbine power station, in addition to 6km of cooling water pipework (up to 2500mm in diameter) and 10km of drainage (between 150mm and 750mm in diameter).